Quartz Plaza in lower Hillbrow is a building renovation project. Originally an established apartment block, the area took a downwards turn a few years ago and went to wrack and ruin. Recently there has been a resurgence and the area is being re-developed. 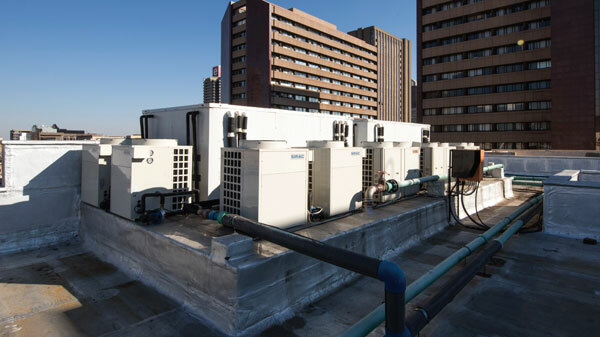 ThermoCube designed and supplied the hot water storage and distribution system for this newly renovated complex – a high density urban rental block housing up to 700 people. ThermoCube has provided a pioneering offering including a system with both high and medium temperature heat pumps as well as a evacuated tube solar array. The solar preheats the system prior to running the heat pumps. The high temperature range machines ensure that the system remains sanitized and reduces the need for additional thermal storage volume. Hot water is delivered to each apartment via an insulated hot water ring main at a guaranteed 60°C at the outlet.